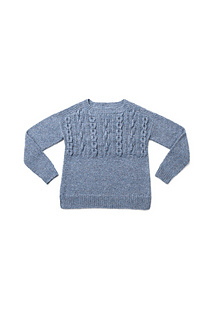 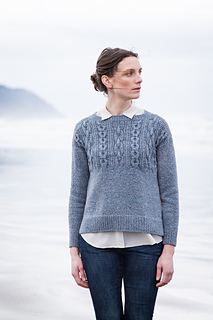 This pullover in Shelter honors every feature of the traditional gansey. 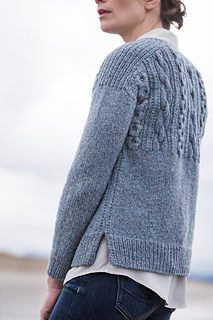 Stout chain cables boldly mark the textured yoke both fore and aft. 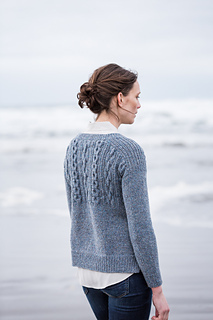 The gentlest of A-lines makes for an easy fit, and details like the split ribbed hem and decorative side seams make Caspian both eye catching and knitterly. 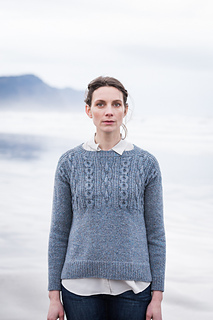 The front and back are worked flat with modified drop shoulders; sleeves are knit in the round to the underarm and then finished with small caps and wide ribbed saddles that ensure a trim, smart fit. 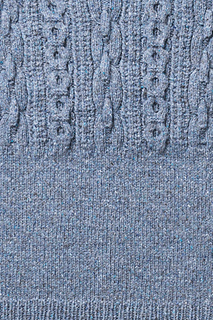 Knit Caspian in a moody blue — we used Faded Quilt — or try Fossil or Cast Iron for the perfect wear-with-anything staple: the burly motifs won’t be lost in a dark color.